Since 2007 fans of Dynasty Warriors and Gundam have been enjoying a match made in heaven. The Gundam universe has lent itself perfectly to Dynasty Warriors' frenzied chaos. For the last three years, however, the series has been quiet. Fortunately, Dynasty Warriors: Gundam Reborn, is worth the wait. Like every Dynasty Warriors game before it, Reborn has you facing down thousands of enemies, laying waste to them with ease. The spirit of all previous series titles is alive and well here, and at a decent frame rate to boot. As with previous games in the series, your mobile suits are quick and responsive, allowing you to jet around corners, or in some instances even fly. The difference in speed between the Gundam branch of the series and the regular titles is a great addition. Combat is extremely satisfying, most mobile suits have the ability to switch between melee and ranged weapons fairly easily and quickly as well as unleash particularly devastating charged attacks that can wipe out 100 enemies at a time or more if done correctly. In addition to these moves , each suit has a hyper mode in which it syncs with its pilot to perform a super move when its meter is full. Reborn, like its older siblings, is rife with options to destroy any opposition, and I wouldn't have it any other way. There's replay value, and then there's replay value. Gundam Reborn offers 120 unlockable mobile suits. 120. That's just insane. This is the type of game you can just pick up and play and get something new just about every time. For any fan of the anime, this is just a dream come true. Dynasty Warriors: Gundam Reborn's campaign comes in two flavors: Official and Ultimate. Official offers you the opportunity to play through memorable moments in the series, where Ultimate is more of a mashup of characters from different Gundam series playing through a kind of what-if scenario to determine the ultimate Gundam pilot in all the universes. The key to the success of both of these modes, however, is their brevity. Both Official and Ultimate campaign modes have their story sections split off into smaller chapters that are playable in any order you choose, with small swaths of content being unlocked as you progress. Each individual section of the campaign has its own save, so you're allowed to swap freely between scenarios if you so desire. Additionally, each campaign only takes about an hour to beat, which is good considering how many there are. More games could stand to learn from Reborn's approach to campaign management. The ability to shift through various points in Gundam history leaves you never really feeling bored, considering it's very easy to just move on to another pilot or mobile suit. Dynasty Warriors: Gundam Reborn offers you what should be industry-standard multiplayer options for any game, but doesn't quite nail the execution. The game offers both local and online multiplayer, but it's the local part that's the problem. As you can see above, when playing locally with another player—which oddly seems only to work in Official mode and not Ultimate, for whatever reason—the screen is split vertically, as opposed to horizontally. For me and those I tried this out with, the screen felt far too cramped to play effectively, especially considering the extra amount of turning you'll have to do to face enemies. Why Tecmo Koei decided not to go with a horizontal split confounds me, as this game desperately needs the player to have that level of visibility. Online multiplayer works in Ultimate mode, and allows you to send an S.O.S. to your friends for help, which I felt was a really cool idea, though I didn't get to thoroughly test it, as I don't know anybody else who has this game. The latest Dynasty Warriors: Gundam game is certainly not the prettiest, and that's a disappointment. It's always difficult to process a sequel looking worse than its predecessor, though in this case that can likely be chalked up to the fact that Tecmo Koei decided to ditch Dynasty Warriors: Gundam 3's far superior cel-shaded format. Although Reborn may look worse than its older sibling, that doesn't mean it's an ugly game by any stretch. The screens in this article actually don't do the title justice. In motion the game looks much nicer than any of these stills and the visuals in no way detract from the fun. Confession— I'm not that great at Dynasty Warriors games. Or at least, I've never thought myself to be. I love the series so I typically work my way through them with no small degree of difficulty. In the early stages of my time with Gundam Reborn I played on easy. As time wore on it felt a bit too accommodating, so I switched it up and went straight for hard mode. What did I find? Hard mode was still pretty darn easy. I don't think I've improved that much, either. Reborn is just an easy game. That's not necessarily a bad thing, but I have a hard time saying it's a great thing, either. If you're looking for a massively challenging game, this probably isn't the one you're looking for. If you're familiar with the Dynasty Warriors: Gundam series, then you likely already know if you want to play this game or not. 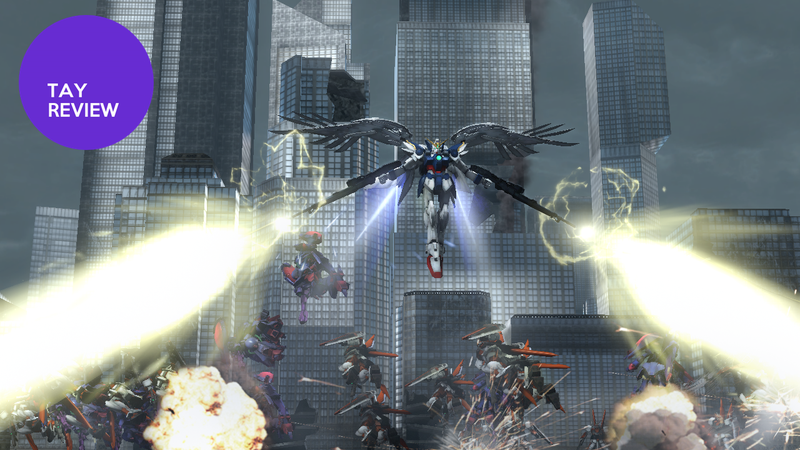 If you're not, however, Dynasty Warriors: Gundam Reborn leaves a great first impression. This is easily the type of game you can play in short bursts for months on end, and every library needs a few of those.